Sorry, I belive I have posted my review in the wrong section. Am new to this forum hopefully this link is allowed as it's a nice little review we did of the Hassleblad 1XD, we get in new kit from our rental company so if people like it I'll carry on sharing ! 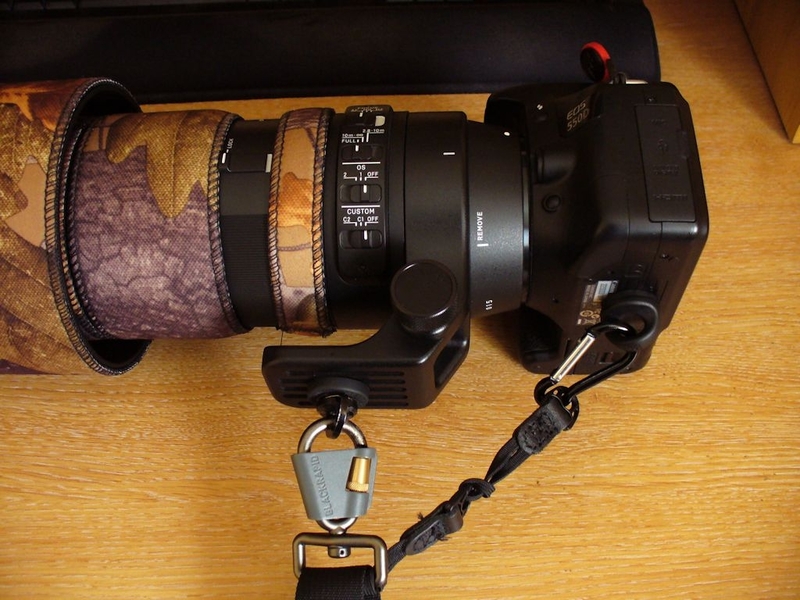 I bought a Black Rapid Curve sling early last year to carry my Canon 550D and Sigma 150-600mm C combination. Because I have problems with my hands I didn't entirely trust the camera bush connector supplied, especially since its tightness relies solely on hand strength. Not a problem for most but a big issue for me. I also felt that for real piece of mind I wanted a second attachment point. I modified it by using a pair of Optech utility loops to create an extra tie to a lightweight karibiner to which I attached the supplied BR connector. The connector looks like a bit of plastic but apparently it's nylon coated metal to reduce metal on metal noise and wear. To the BR karibiner I attached a Peak Design prodrive connector which has an allen key socket - much better for me. The prodrive connector goes on the lens foot, the BR connector to the camera's tripod bush, as shown in the pics. That was great till I read the thread in the equipment section (Black Rapid strap wear). First I didn't worry too much as the OP had an older BR with a metal connector, then I remembered that I also had a metal connector due to my mods, and when I checked, although there's nothing visible, I could feel a couple of notches in the karibiner. Whether they really are from wear I don't know but that's how it feels, a bit alarming since the strap hasn't exactly had a huge amount of use. I could mess around with it and fix things but instead I opted to replace it with an Optech utility sling strap. 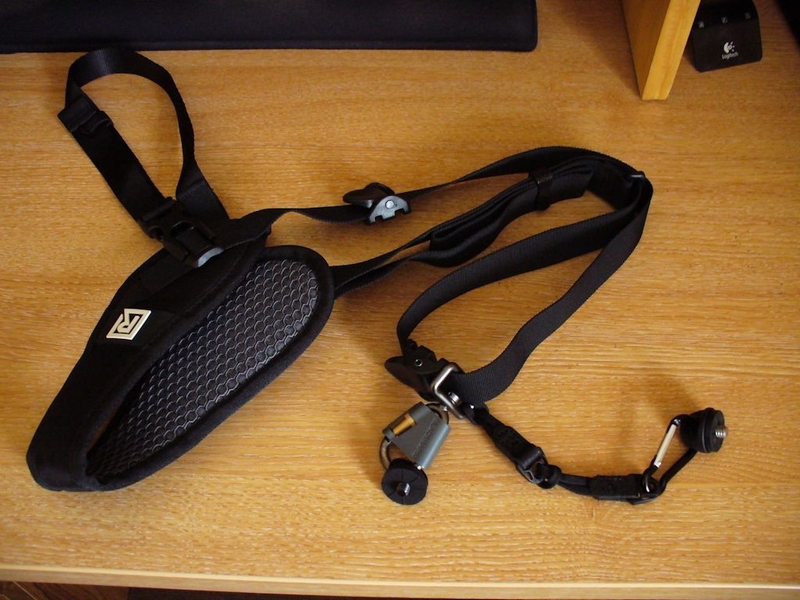 I have no qualms about any quality issues suggested by the low price of the Optech sling - there aren't any. I've been using Optech straps on my tripod and spotting scope for ages and they're fine. Someone asked me for a comparison of the two so here we go. BR Curve (cost £75). Looks and feels like quality and for the large part it is. Comes complete with a detachable underarm strap and tripod bush connector, so unless you want a second connector there's nothing else to buy. The metal components make it quite weighty. The reinforced shoulder doesn't have the 'give' you feel in the Optech straps but still takes the weight well. Bear in mind I'm a short, slim lady not a hulking bloke so the camera/lens combo is pretty heavy for me. I like the underarm strap as it stops anything sliding around. I'm usually carrying a rucksack over the sling then taking the rucksack on and off so the last thing I want is the sling moving on my shoulder, and the underside of the shoulder isn't that grippy. However there is only one attachment as standard, so if you feel you want or need a second it's a diy job, hence my mod detailed above. The slider the karibiner attaches to never seemed to slide that readily on the strap, so lifting the camera to use wasn't as smooth as I felt it should be. That may be a result of having the Optech loop round the slider, but short of rigging up a diy second slider there's nowhere else to attach it. The metal components can create noise - not much but it could be an issue for people who stalk wildlife rather than sit in a hide. The stops are quite hefty and noisy if the slider makes contact, probably not that easy to muffle. Even if I was using the BR as standard, out of the box and unmodified, I'd still be checking the karibiner regularly for signs of wear. The karibiner/slider assembly doesn't appear to be a replaceable item, or if it is I haven't found it. 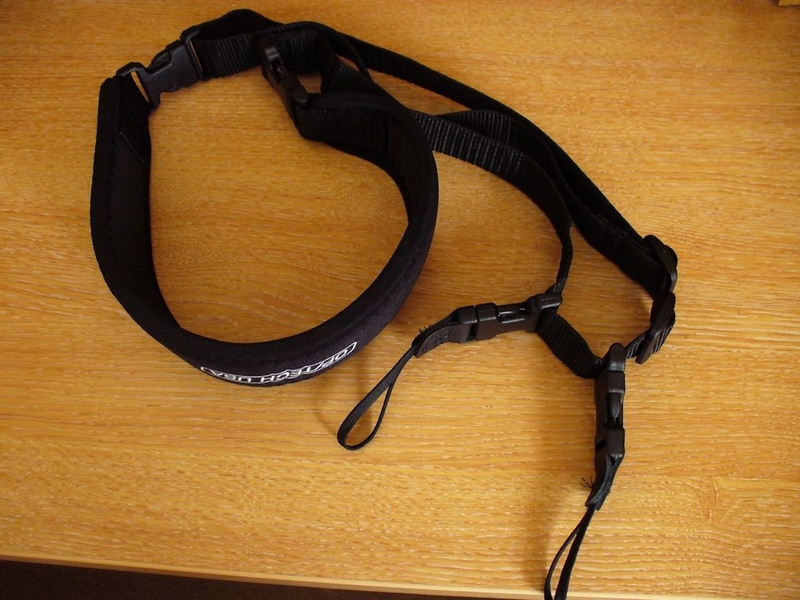 Optech utility strap sling (cost £16.25). There is a bit of give in the shoulder piece to ease the load. From experience tramping miles with a heavy Manfrotto 190 metal tripod and 3 way head I know it works. There's no underarm strap but the underside of the shoulder is grippy. Two fixings come as standard. Everything on this strap is clip together so compared to the BR it's a lightweaight. I was a little worried about the possibility of the two connectors on the strap itself, attaching the shoulder pad to the main strap, coming apart. The tripod strap doesn't have them. As a precaution I bought a pack of Secure-its - velcro tags that wrap round the connector and totally secure it. £6.99 for the pack of 4 but effectively free as they pushed the cost of the order above Amazon's £20 free delivery threshold. Having struggled with some of the connectors I don't think there's any chance of them coming unclipped accidentally - ever! This for me is a slight downside of the Optech sling. The BR sling uses karibiners which are very easy to clip on and off. The Optech uses two Uniloops. 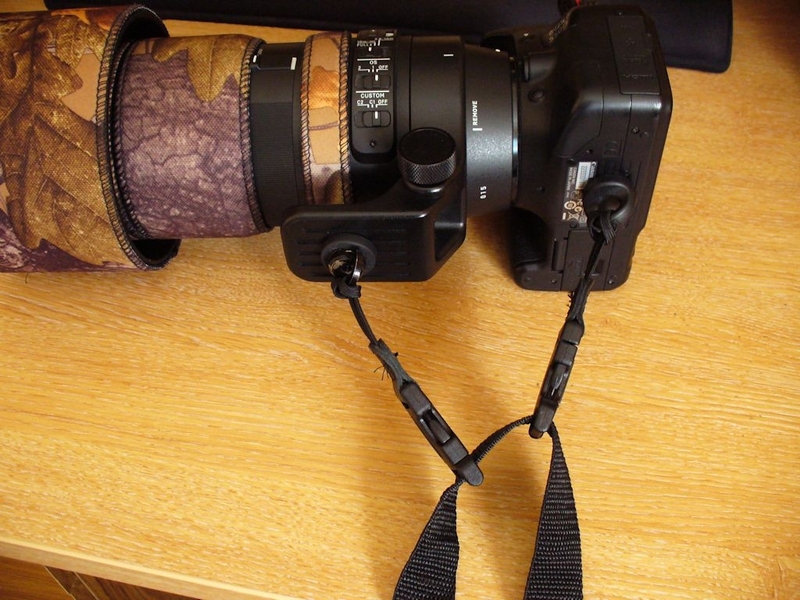 It doesn't come with tripod bush connectors as the uniloops are designed to go on the camera's strap bars, so you're buying your own bush connectors if you don't have them, and they're not cheap. The uniloops clip into connectors on the sliders and it hurt my hands getting them off and on. Again not a problem many folk would have. There's a knack to it and I haven't quite got it yet. The sliders move much more freely than the BR one. I don't know yet if the all metal prodrive connector I'm using will damage the uniloop, however if it does they can be replaced (£6.40 for the pair. They're male-female and female-male, so they're not interchangable. I'm assuming there's a good reason for that but I can't immediately think what). It is possible to get a bit of noise if the sliders contact the triglide serving as a 'stop', however a bit of tape round the stop could muffle that. In summary, tbh both slings have their pros and cons, and were it not for the prodrive all metal connector either sling would suite my needs equally well. I haven't used the Optech in anger yet so I don't know which I'm going to prefer. The Optech is very good value for money but bear in mind if you want bush connectors and don't have them you're adding £10 or more each depending on what you buy. However you want to adapt these slings to your own specific needs, between BR, PD and Optech there are plenty of bits and pieces available for doing it. 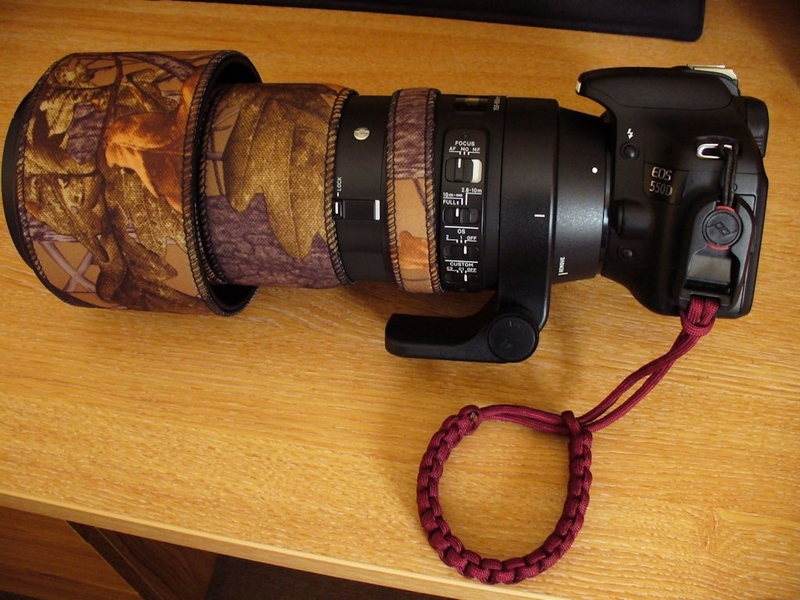 And for completeness here's what I use when the lightweight lenses are on and I'm carrying the camera/lens in its Lowepro case in a rucksack - a nice little Cordweaver wrist strap. I use the Peak Design system for easy on/off. I do have the standard Canon neck strap but my hatred of neck straps goes way back to my 35mm days.